The Sutton Bar Height Stool is a mixed media piece of furniture with an aluminum frame, woven wicker accents, and an all-weather cushion with fabric. It fits into the Sutton collection of patio furniture, which includes a dining set, a deep seating set, a chaise lounge and more. 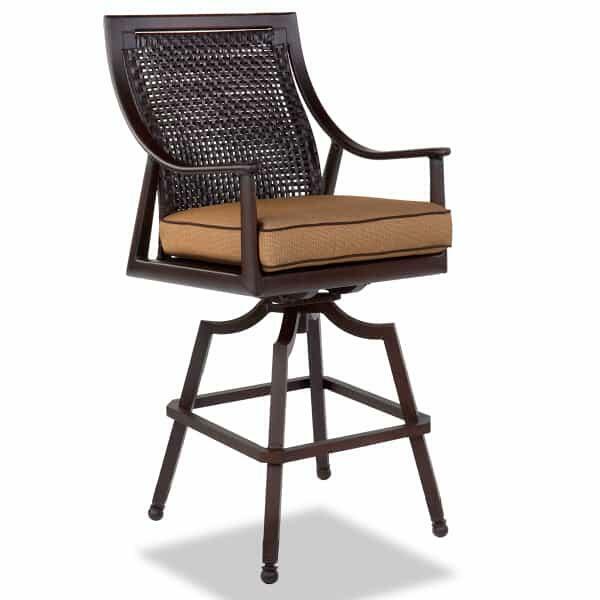 The bar stool frame is extruded aluminum that has been finished with an extensive cleaning, buffing, sealing and finishing process made by Cast Classics. The woven wicker accents are made with hand-woven synthetic wicker. The faux wicker material stands up famously to outdoor elements, like rain, wind, salt and more. The cushion is all-weather and covered in an all-weather fabric. Both the frame color and fabric design is customizable by you, and Cast Classics has a huge range of options to choose from.